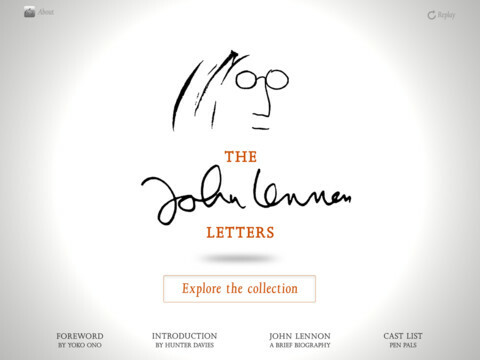 While we’ve known the app was coming for at least a month now, The John Lennon Letters finally landed in the App Store this week, three months after the hardback book rolled out, bringing the personal musings of the Beatles legend to iPads the world over. Coming in at a rather punchy $8.99 (£5.99), this one could be for only the most serious of Beatles aficionados, but it brings in a pretty extensive collection of private letters from Lennon, annotated and contextualised by Hunter Davies, the same author who produced the only authorised biography of the Beatles. The app also contains links to the Beatles and Lennon’s music in iTunes, including Imagine, Paperback Writer and A Hard Day’s Night, which could prove to be a nice littler earner for the creators. Whereas the book contained more than 200 letters, this app focuses on 78 letters taking readers on a trip through Lennon’s life. 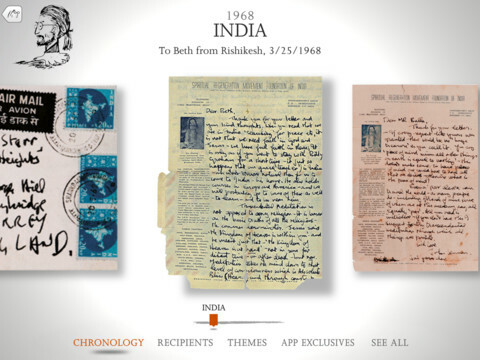 The collection is presented through a series of curated collections by periods, recipients, themes, and with ten letters exclusive to the app. Each exhibited letter is supported by a transcript, commentary notes from Hunter Davies and annotated contextual highlight panels. Combined with Eccelston’s audio readings (in the role of John Lennon) and connected to the Beatles and Lennon’s music, it’s likely to appeal to many Beatles and Lennon fans. And no Lennon entity would be complete without a contribution from Yoko Ono…right? Right. Ono pops up in the foreword, recording an introductory tidbit for the app. The John Lennon Letters iPad app is available to download now for $8.99 (£5.99 GBP).